The self-proclaimed “front page of the internet” information website, Reddit, has a loyal and passionate userbase. There's a subreddit for almost anything, and an active community behind each topic. 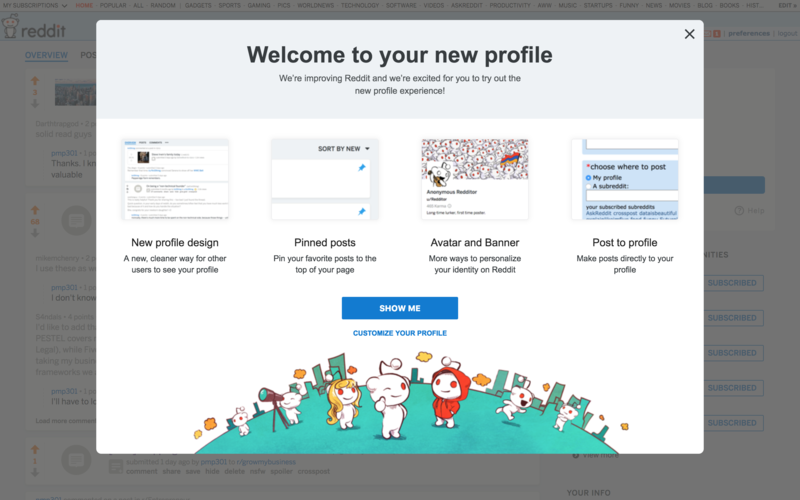 With their latest site redesign, they introduced more options for users to customize their profile — and they managed to present this redesign in one window. Anyone familiar with internet trolling knows that Reddit can definitely be a hub for this annoying hobby. One can easily imagine a die-hard Reddit user angrily clicking through multiple tooltips, had Reddit chosen that method to onboard users to their redesign. However, in one, clear pop-up, they fit every new feature the user needs to know, while offering multiple exit routes. Each of the four new profile customization options is accompanied by the relevant screenshot, showing users where to expect (and customize, if desired) each update. Each option gives just enough information and leaves it up to the user to go explore. Reddit also gives users the option to be shown the new interface, taking them right back into Reddit, or to start customizing their profile then and there for the more excitable crowd. Segments of the Reddit community can be quick to judge, so presenting their userbase with this option is a great way to appeal to multiple sides.